Do you still use your spray bottle, towel, and mop for cleaning your home? To keep our home clean is an important aspect of our life. We cannot even think how difficult it is without steam cleaner because each time you are not getting comfortable in cleaning with a cloth, towel or a mop. Did you think ever you are spreading bacteria all over your floor with every move? Frequently; vacuuming and general cleaning are not sufficient to keep us satisfied. So, here is the time to get steamy now. Steam cleaning kills 99.9% of bacteria, germs and dust mites with the help of steam cleaner. Steam cleaners can be used to clean a variety of surfaces and items but not each steam cleaner are suitable to use for every job. There are many types available in a steam cleaner for the home purpose that including carpet steam cleaner and steam mops but some of most resourceful are handheld steam cleaner which is become the most popular choice. 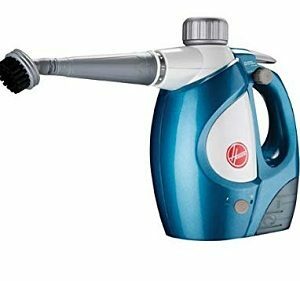 Looking for best handheld portable steam cleaner but not sure which one is perfect to buy? Then don’t go anywhere! Here is the best handheld portable steam cleaner available for you. The Bissell Power Fresh Slim Hard Wood Floor Steam Cleaner is a 3-in -1 machine made up by the brand Bissell. It is lightweight, efficient and flexible which kills mold and fungus without chemicals. This system holds a capacity of the 12-ounce water tank which is almost double the capacity of other steamers in its class and has the long power cord length about 25 feet. This system is safe to use on sealed hard floors like hardwood, ceramic, granite, and marble. It is packaged with a handheld pod, extension wand, and mop pad foot. It also provides with the spread of accessories and attachments. 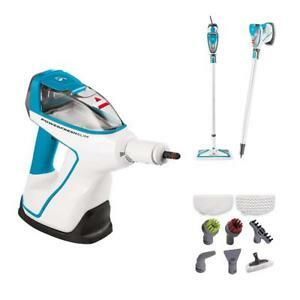 It has the ability to clean above floors or in tight spaces when using the Extension Wand and also has the right of converting into a handheld steamer when removing the Extension Wand. The steam trigger allows you to distribute just the right amount of steam onto your floors. It also brings features like a digital control panel which allows the user to select between low and high steam output. The Bissell Steam Shot is beautifully designed by brand Bissell. It is easy to use and heated up in about 30 seconds. This system holds tank capacity up to 6.6-ounce. 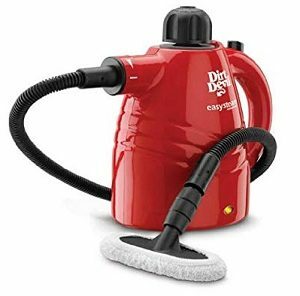 This steamer is extremely powerful and easily cleans an entire room in a single step which comes with cord length about 20 feet. It can easily disappear all the dirty spots and sticky substance without the use of dangerous chemicals or detergents. It comes with a trigger which helps us adjust the steam pressure. It also has a lot of accessories such as window squeegee, nozzle, extension tube, fabric steamers, different brushes, and angle concentrator. This cleaner comes with on-hand storage kit which allows you to carry all accessories while cleaning. 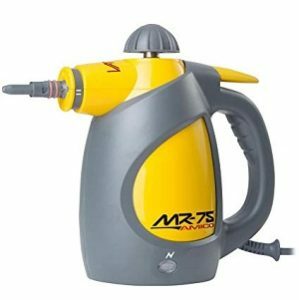 Vapamore MR-75 Amico Handheld steamer is built by brand Vapamore. MR-75 Amico is a wonderful little real machine, portable, lightweight and easy to manage which comes with fine attachments some are made of nylon brushes and some are with metal brushes. This system holds tank capacity up to 6.6-ounce and has power cord is short in length up to 10 feet. It comes with measuring cup like as funnel that uses 200ml distilled water for preventing mineral clogs. This machine does not give on/off switch. When it is plugged in, that time only it gets started and then red light turns to green light. It is 100% chemical free cleaning system. This system has given a lifetime warranty. PurSteam Handheld Pressurized Steam Cleaner is well designed by brand PurSteam World’s Best Steamers which is a high-quality steamer, heats quickly with 3 to 4 minutes warm-up time and very comfortable to use. Overall, this cleaner made up very well with high-quality material. The capacity of the water tank holds about eight-ounces. It is a lightweight and portable unit comes with a long 9.8-foot cord that is convenient indoor and outdoor use. This handheld steam cleaner is safely used on a wide range of surfaces including ceramic tile, granite, waterproof wood flooring, laminate tiles, cotton and wool carpets, and washable wallpaper. It also has all the necessary attachments at a reasonable price. Dirt Devil PD20005 is manufactured by dirt devil which is lightweight and portable along with ergonomically-designed handles. It comes with a larger water tank with a capacity of 8-ounce and heats quickly with 4 minutes warm-up time and provides cord length up to 10 feet. It also gives a safe high pressure which cleaned all the hard-to-reach areas. It also offers a jet tip extension helps in directing steam at intended targets while other extensions can be used for removing wrinkles, brightening counters, or functioning as a grill brush outdoors. This handheld cleaner helps to remove dirt and dust in your home and cleans above-floor surfaces, such as countertops, shower doors, window treatments. 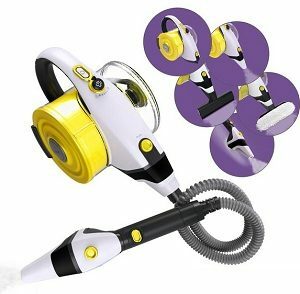 Hoover Twin Tank Handheld Steam Cleaner comes from a family of a brand called Hoover which is lightweight and has a long power cord up to 17 feet because of long cord you can easily move throughout the room while cleaning. It also offers a unique approach to steam cleaning by utilizing an adjustable control. The water tank capacity is size at 11.5 ounces which have a separate reservoir so you can able to add the included cleaning solution to help the toughest stains. There is one more separate button to dispense the cleaner which is biodegradable and non-toxic can be safe around your children and pets. It also has a large surface tool. 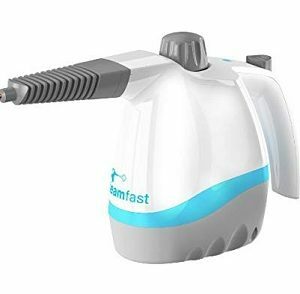 Steamfast SF-210 is an extremely portable, inexpensive and compact unit which has the ability of a good quality cleaning. Overall, it has a small water tank with a capacity of 6-ounce and with 12.5 inches of cord length. This cleaner is a reasonably-priced steam cleaning equipment works for both home and commercial use. It also contains a 28-inch extension hose which allows you to get deep into hard to reach places that are often not used, like behind the toilet or refrigerator areas. 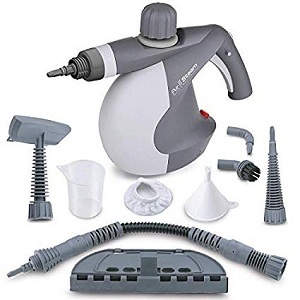 It also provides with plenty of accessories which will help you clean various surfaces easily such as a steam jet nozzle, measuring cup, utility brush, cloth clover, squeegee, large steam nozzle and many more. It also has an indicator light that tells you when the steam cleaner is ready. 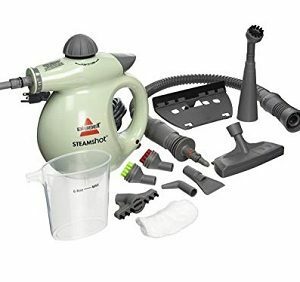 The Nugeni Steampac is a simple, compact and portable handheld steamer with an extra large water tank that allows for up to 39 minutes of continuous steam cleaning and has a 28-foot cord. It also eliminates 99.9% of germs, bacteria, mold, mildew, and even bed bugs – without the use of chemicals. This portable handheld steamer works in heavy, even in the dirtiest and hardest to reach places. It also provides wide, spread out steam output for cleaning flat surface areas of hard or soft materials. Overall, it is perfectly used for countertops, backsplashes, kitchen appliances, stained carpet spots, freshening fabrics, sanitizing toys and mattresses, unclogging drains, cleaning grills, sinks, toilets, showers, grout, windows, mirrors, and much more.